Our building and facilities are looked after by Mr Anderson and his team of stewards. Our building is heavily used. As well as 800 pupils and over 100 staff using the building every school day, as a community school, our building remains open until 10:00pm most weekday evenings for community events and classes. These might include Indian Cooking classes, Spanish, Zumba, or Piping. Additionally, our Community building accommodates our PE Department, and is also home during the day to pensioners groups, mother and toddler groups, and a huge variety of other community users during the evening. Maintaining the building at its best is a demanding job, but we also have extensive grounds. Two Multi Use Games Areas (MUGAS), a floodlit, all-weather AstroTurf pitch, car-parks, paths, hedges, trees, fences, and large athletics fields all need to be maintained to a high standard. Mr Anderson, our Facilities Manager and his team are dedicated to ensuring the building, facilities and grounds remain fit for purpose. Vital to the management of our facilities is the superb work of our Cleaning Manager Mrs Val Barron and her dedicated cleaning team. A building of this size and age, with so many users coming in and out all day is a challenge to keep clean. But Val and her team take immense pride in their school. 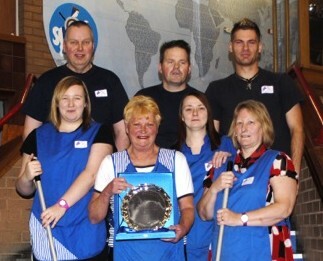 They recently came second in the British Institute of Cleaning Services competition. This wasn’t just about cleaning standards, but also covered training, health & safety and practical demonstrations. There are very few schools whose cleaners match the standards expected by Val from her team, and we are extremely grateful for their support and efforts all year round.